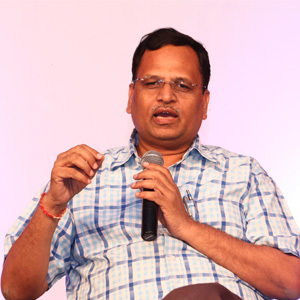 Satyendar Jain, is a Cabinet Minister in the Delhi Government and a member of the Aam Aadmi Party. He is an architect by profession. Before entering politics, Jain worked at the Central Public Works Department (CPWD). Upon quitting his job, he set up an architectural consultancy firm. Jain has worked with social welfare organizations like Drishti, an organization dedicated to help the visually impaired; and Sparsh, an organization working for the empowerment and welfare of the physically and mentally challenged.